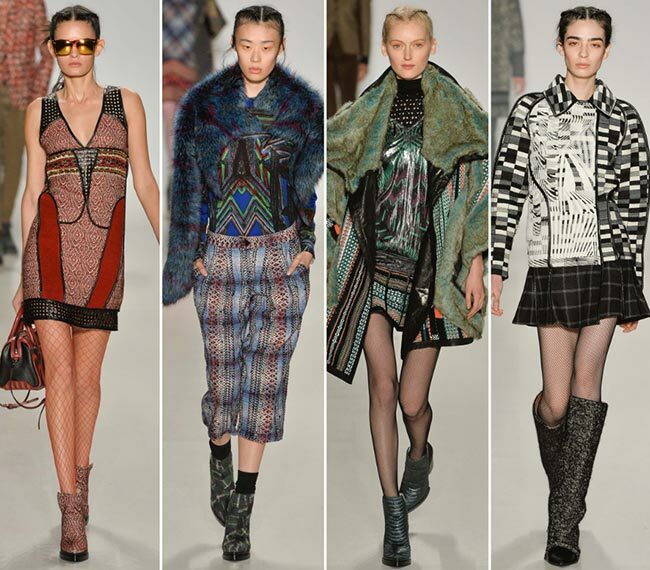 The Custo Barcelona fall/winter 2015-2016 rtw show cast on the fourth day of New York Fashion Week fall 2015 unveiled a big parade of diverse shapes, shades and patterns, showing the essence of the Catalan brand in all its splendor. For the upcoming cold season, the creative director of the brand, Custo Dalmau went for flirty mini lengths and his signature mishmash of various prints and patterns finding his inspiration in car wash. The new Custo Barcelona collection proves that there are absolutely no limits when it comes to finding the most correct inspiration source for creating statement-making pieces. The car wash theme was brought to life through the printed streamers used for the skirts and dresses, which resembled the pieces of the cloth fabric used at the car wash.
We always expect a plethora of busy patterns and bold colors at Custo Barcelona collection presentations, details that have perfectly shaped the style ideology of the brand through years. Pleasantly, the Custo Barcelona fall/winter 2015-2016 collection didn’t lack them and we also saw amazing tribal embroidery, imaginative patchwork and appliqués that gave a futuristic touch to the everyday designs. While the color palette appeared to be slightly muted to match the cold season mood, there still were interesting combinations and some occasional pops of brights. Expects lots of black and white combinations, grays, blues, camels, browns and burgundy shades, which are skillfully combined with luxurious golden motifs, pops of orange and pink. The Custo Barcelona clientele is the group of bold and self-confident women, who love stealing the attention wearing overly printed and colorful clothing pieces, which are also sophisticated and feminine. You won’t be looking for monochrome and dull pieces when stepping into a Custo Barcelona store and their new season collection absolutely lacks such looks. Those, who are more into a simplistic style, will love the opening looks of the collection featuring black, gray and white colors and checkered prints combined with abstract and graphic touches. Even the boots finishing off the looks are checkered and we have seen this trend in many other collections unveiled during this fashion week. Little pleated dresses and mini skirts, oversized coats and shorts, tribal motifs, plaid and tweeds are the core features of the Custo Barcelona fall/winter 2015-2016 collection, which is more about chic daywear pieces. What makes the designs especially cool and diverse is the creative mishmash of classic silhouettes with experimental shapes and the futuristic fabric combinations. Heavy tweed and knits are harmoniously combined with sheer metallic-threaded fabrics or with leather inserts for the modern feel. Of the common fall 2015 trends spotted at the show, we should single out the colorful furs and mohair, which give so much warmth and luxury to the looks. Culottes and asymmetric hemlines are also big this fall and we have some absolutely striking interpretations of the trends in the collection. Especially cool is the short-sleeved plaid tunic with the asymmetric hem and leather inserts, which comes teamed with short shorts using the same fabric and print. While the lengths of the dresses, shorts and skirts are kept extremely short to place the focus on the leggy legs of the models, those pieces mostly use heavy fabrics and come topped with cozy outerwear designs to appear more winter appropriate. In addition, the collection has some striking party dresses with intricate detailing so much peculiar of Custo Barcelona. All in all, it’s a beautiful collection, which manages to satisfy the expectations of the devoted Custo Barcelona customers, as well as offers something unique and cool to those, who have never experimented with the brand’s designs previously!